Editors Note: There are two videos and two photos included with this release. Mashup Arts, announced the launch of its Holiday and Christmas ecard service designed for video and photo lovers of all ages. The new online service helps people create their own custom cards with multimedia tools. The opposite of mass market cards, these greetings can be highly personalized by embracing the diversity of the visual Internet. The idea is to start with photos and designs from the community, and then mix in free Internet content from sites like YouTube and Flickr. People can also add their own pictures, music or videos so their greetings really feel "home-made." "With so much creativity being shared on the Internet, we feel there is huge market for a new class of greetings where talented people share their ideas, and anyone can mix in their favorite content," said Shaun MacDonald, CEO of Mashup Arts. "The key is to help people get started, and for that, we have built a model with templates, simple design tools, community sharing and artist attribution. If we can catch the wave for sharing and remixing content with shared workspaces, we will create a new segment in this market." The social community stands in contrast to the classic studio model, where you shop for cards and sign them. This new model allows people to be creative with simple on-demand search and design tools, so they can mash up titles, photos, videos and music to match their personal style. Users can import their photos directly from Facebook. Cards that are made public can be browsed for ideas, and reused in whole or in part as people create something new from something old. The ability to mix in multiple videos and photo slide shows is unique in the market, and this is of particular value for people interested in creating team, school, group or family cards. Free to use, the ecard service will make money through premium value added modules for printing, DVD's and storage, as well as enterprise services for companies to bolster their brand promotions. The technology platform is a thin web based application with a flash interface for rendering videos, images, music and text. The workspace environment was developed in PHP and AJAX, with numerous technology API mashups like YouTube for videos, Flickr with a Creative Commons API for photos, CCMixter with a Creative Commons API for music, and Picnik for photo editing. The greetings are assembled on the fly from their discrete elements. This is to enable remixing so images and videos can be shared within the community, and it reduces storage by avoiding content duplication. Mashup Arts is the "Mashup Card Company." Our website was built for social networkers who want to share video ecards and photo ecards by mixing their personal content with free Internet content. We encourage individual and community creativity. The application offers options to customize ecards so they better reflect your style or brand. You can also create group ecards for your office, team or school. We help people to play with photos, videos, text and music to create unique and memorable cards. The flexibility and search options are suited for our diverse cultures. Check out what our community members have made for your Birthday Cards, Weddings, Christmas and the Holiday Season, Valentines, Chinese New Year, Diwali, or your favorite charity event. Free Christmas and Holiday ecards. 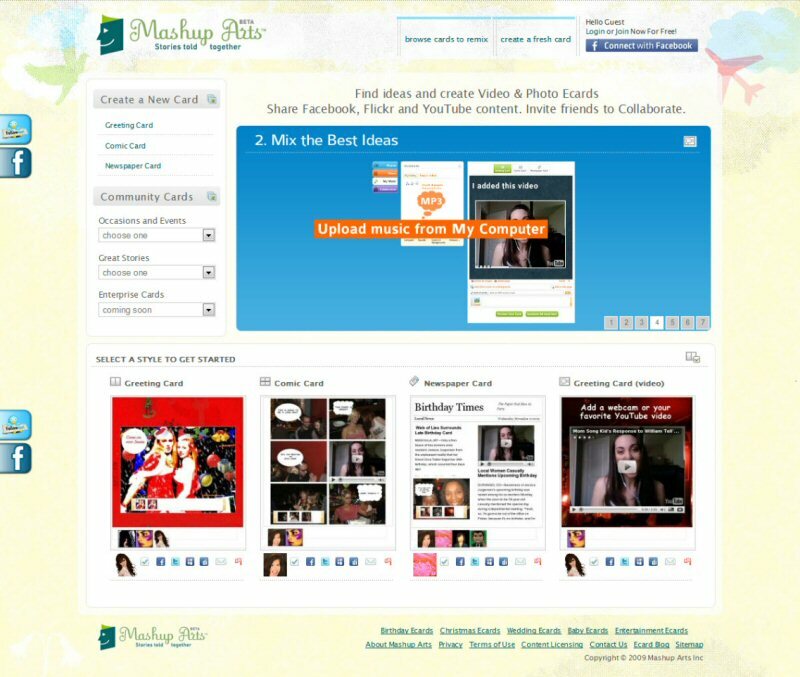 Options to add pictures, videos and even collaborate with friends and family for social cards. Free Christmas and Holiday ecards. 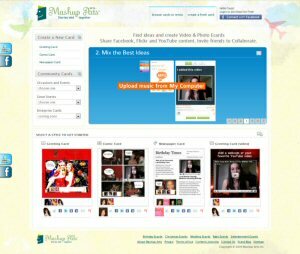 Options to add pictures, videos and even collaborate with friends and family for social cards. Personalize to match your style.